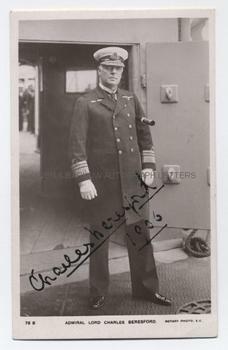 ADMIRAL CHARLES BERESFORD Photograph Signed. Photograph with full Autograph signature of Charles Beresford across the image and also dated in his hand, 1906. A pleasing photograph in which Beresford, the very personification of the British Admiral, is shown full-length on the deck of a large ship, probably of the early 'dreadnaught' class. He is in full naval uniform, with a telescope clasped under one arm. The portrait is a real photograph post-card by Rotary. It measures approx 5.5 x 3.5 inches. Addressed on the verso to Mrs W.H. Rickinson, 77 High Street, Redcar. In fine condition. Admiral Charles Beresford, known to the British public as "Charlie B" was considered by many to be the inspiration for 'John Bull', a comparison that was evidently pleasing to Beresford, who was often to be seen accompanied by his trade-mark bulldog. Charles Beresford first went to sea, aged 13 and rose quickly through the ranks. He was a friend of the future Edward VII and was disapproved of by Queen Victoria as a bad influence on her son (which he probably was) but later fell out with Edward over their rivalry for the affections of Daisy Greville, Countess of Warwick. Beresford fought in Egypt and the Sudan and won the admiration of the British public when he brought his ship within close range of enemy guns during the shelling of Alexandria in 1882. He also fought with the ground forces in the Gordon Relief Expedition, operating a Gardner Machine Gun, and was almost killed when his gun emplacement was overrun by the enemy. 1906 was a significant year for Charles Beresford as it was the year in which he might reasonably have expected to become First Sea Lord on the retirement of Admiral Fisher. However, Fisher's appointment as Admiral of the Fleet extended his retirement age and Beresford never achieved the position which he so desired.